TEXAS CITY, Texas, March 26, 2014 (ENS) – For the first time since the collision of a bulk carrier and a barge Saturday spilled 168,000 gallons of oil in the Houston Ship Channel, authorities have reopened all lanes of traffic. Although cleanup is still incomplete, ships are now permitted to sail in and out of this busy waterway. The Houston Pilots report 14 vessels have sailed with 29 more pending outbound and 46 waiting to come in to the Port of Houston. Ship movement is restricted to daylight hours. Meanwhile, the U.S. Coast Guard is intensifying efforts to clean up the heavy marine bunker fuel in the Ports of Texas City and Galveston, as thunderstorms and high winds late today and into Thursday are expected to hinder or halt operations due to safety concerns for responders. Storms may keep crews from being able to safely collect oil on the water and along the shoreline. Response efforts will focus on cleaning Pelican Island and north to the Texas City Dike until weather makes operations too hazardous. The weather is expected to flush out pockets of oil that responders have been unable to reach over the past few days. Once weather abates, responders will be re-assessing the area to update cleanup plans for immediate action. 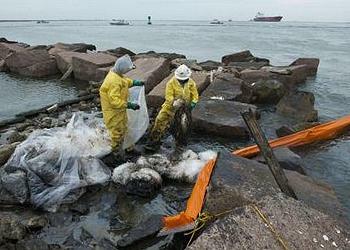 To date 19 miles of nonconsecutive shoreline have been fouled by the spill, the Coast Guard reports. A total of 70 response vessels are assigned to cleanup duties, and authorities have 940 personnel in the field, in addition to the 324 people staffing the Incident Command Post. Weather conditions Tuesday in the Ports of Texas City and Galveston pushed oil 12 miles out into the Gulf of Mexico, and in a southwesterly direction along the coast. The Unified Command has established a second Incident Command Post in Port O’Connor to prepare to protect the environment in the Matagorda area. Responders and equipment began arriving at Matagorda Tuesday, and will continue arriving today. The oil was spilled mid-day on Saturday when 585-foot bulk carrier Summer Wind and a barge containing 924,000 gallons of marine fuel oil, towed by the motor vessel Miss Susan collided. The Miss Susan, owned by Houston-based Kirby Inland Marine, was taking two barges from Texas City to Bolivar at the time. The damaged barge was moved Sunday from the location in the channel where it was struck to the leeward side of the Texas City Dike, where it will remain until moved to a shipyard for repairs. Kirby Inland Marine has spilled oil in the area before. According to the Texas General Land Office, the company held the previous record for oil discharged into Galveston Bay, with a 2001 barge collision that caused a 44,100-gallon spill. A U.S. Coast Guard investigation into the current incident is ongoing. Today, the Galveston Bolivar Ferry is scheduled to resume 24-hour operations despite the fact that oily conditions still exist. Recreational boating and fishing is still open outside the current safety zone. A vessel decontamination plan has been established to assist vessels impacted by the oil. Decontamination stations are at Pelican Cut, Galveston and Bolivar. To schedule a vessel decontamination call (832)-244-1870. Wildlife responders currently include experts from U.S. Fish and Wildlife and Texas Parks and Wildlife Department. They are responding with rehabilitation, husbandry and stabilization trailers staged along the Texas City Dike, Bolivar Peninsula and the Phoenix Pollution Control Facility. Responders have found 30 birds that were dead on arrival to the stabilization trailers, and they are currently rehabilitating 12 birds. According to TPWD personnel on the scene, Bolivar Flats is currently a potential hotspot, since it is a refuge for birds. They expect oiled birds will fly there, and with decreasing temperatures, more impact on birds is expected. High tides could cause further impacts as habitats become inundated. Wildlife responders are asking that members of the public do not pick up or try to assist any oiled wildlife, including birds or marine animals. If anyone observes impacted wildlife, please call 888-384-2000.